Dog grooming - even just baths- can be a challenge for many breeds, not so for the Cavalier King Charles Spaniel. Known for their sweet dispositions, expressive eyes, and affectionate nature, surprisingly these small dogs can be groomed easily at home. 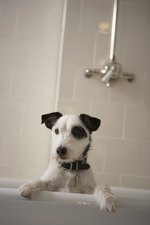 When bathing and grooming your dog, begin by examining them with your hands and eyes from head to tail. Feel for mats, tangles, skin bumps and any changes or tender spots. Make sure to lift up ears, examine your dogs teeth and gums, and roll the dog over for look at their tummy and pets. Brush your dog out thoroughly with the slicker brush. Cavalier King Charles do vary in the kinds of coats they have, straight, curly long and short. Use the comb and slicker to get all the tangles out before bathing. While it is never proper to use clippers or scissors on the coat of a cavalier, it is acceptable to trim the hair underneath their paws, in between the pads of their feet. The long hair on their paws are called "slippers" and are a charming feature of the breed. It is a good idea to trim between the pads of their feet, especially if you don't want them skating around on hard surface floors. Trim the dogs nails. Cavaliers are often babied by their owners, but if you know how to trim a dogs nails correctly, do so. If you do not, ask your vet to show you. Get the dog in the bath and wet down. Use the amount of soap necessary and begin at the head and ears. Work the shampoo into the fur in small strokes from head to tail, working down each leg. Rinse the dog thoroughly. Pat the dog dry. Flush the ears out with a natural ear flush, or one recommended by your vet. The ears of a cavalier are long and prone to infection. Flush those eyes out, and use a tear stain protector underneath if your dog has troubles. (One or two blueberries a day will also help with the tears). Towel dry the dog and spritz some detangler on, like "The Stuff" for dogs. Run it through the dogs coat with your hands and then comb the fur with a wide toothed metal comb. Cavaliers can air dry, but for that well groomed straight coat finish a dryer works best. you get to choose. When the dog is completely dry, brush the hair out. Brush your dogs hair out daily, check ears a few times a week, and you are good to go. Cavalier King Charles Spaniels need very little maintenance for a toy breed.